So … The first of our gorgeous, hand painted, vintage bags is ready! A lovely red faux leather bag with short handles and A proper retro gold coloured clip fastener. 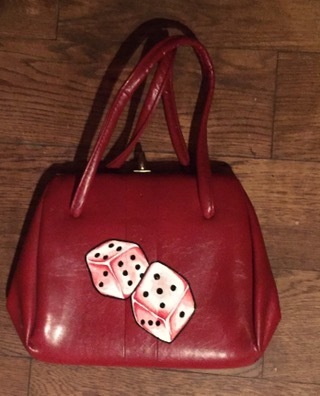 Lee has hand-painted a pair of lucky dice on the front. This bag is an ‘absolute must’ for a rockabilly loving, vintage girl. Each of our bags is going to be completely unique … whether the bag is painted with roses, swallows or hearts, or of course these pair of winning dice, they are going to look pretty special. This one is just £17.50! (Although saying goodbye to this little beauty is going to be damn hard).